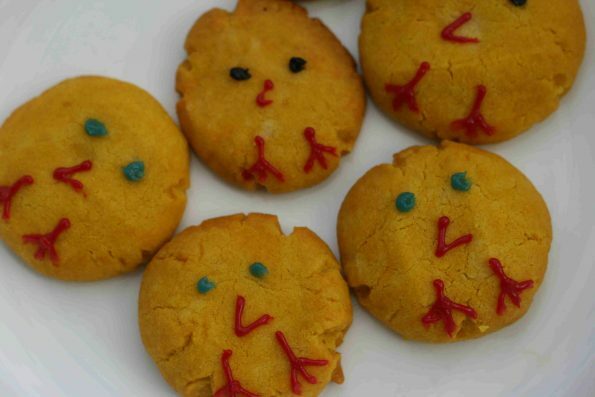 Easter is a great time to bake with children. 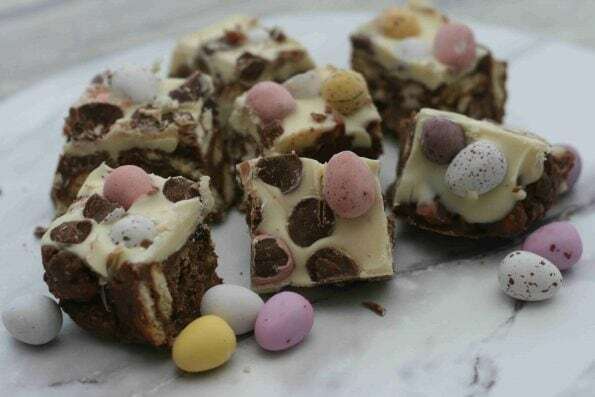 There are loads of ways of taking a simple recipe and making it more fun, by either adding in some extra Easter or mini eggs or making a cute Easter character. 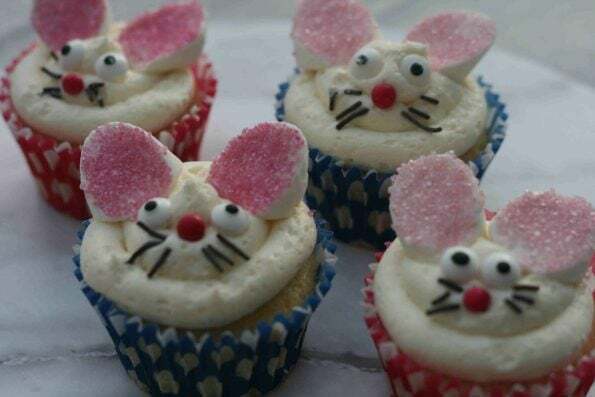 I’d seen someone use marshmallows for bunny ears so thought they would be perfect for some sweet Easter bunny cupcakes. It was easier than I thought it might be to do, although I’m not sure whether they look more like mice or bunnies! 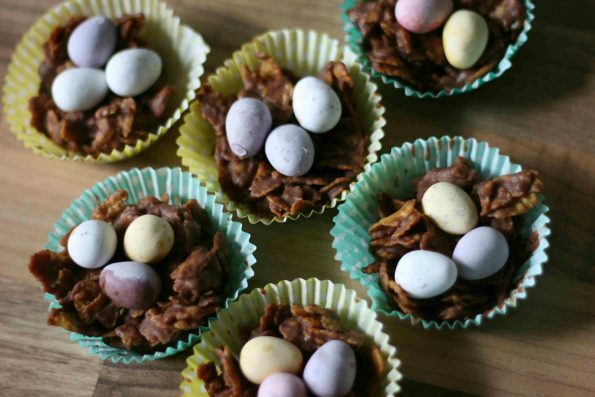 Either way, my kids loved them and I think they’re something we’ll do again when we next do some Easter baking. Get your kids to measure the flour and caster sugar and add them to a large mixing bowl or freestanding mixer. While they are doing that, add the baking powder and salt. Add the butter into the flour and sugar and mix it together using the k paddle of your mixer or a handheld mixer (or your fingers) until you have a sandy/breadcrumb texture. Get your kids to measure the milk. The easiest and most accurate way of doing this is using the ml setting of your digital scales if you have them. Then, add the milk into your mixing bowl. 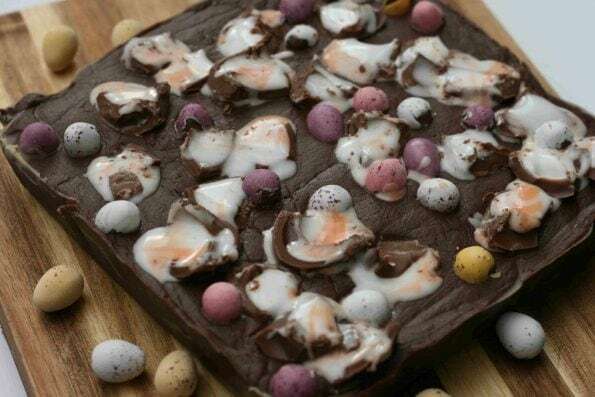 Add the egg – get you kids to crack it first into a separate bowl in case they get any shell in, then add it your mixing bowl. Add the vanilla extract while they’re doing this. Mix everything together until you have a nice smooth batter. 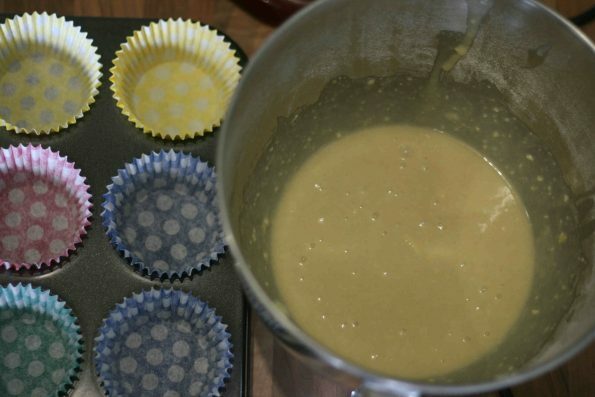 Fill each of your cupcake cases with batter until they are about ¾ full. We tried using our ice cream scoop to do this, and it worked beautifully – it gave us just the right amount and the shape of the scoop meant we hardly spilled a drop! Bake the cupcakes in the oven for 12-15 minutes. They’re ready when they have risen, and turned a nice golden brown colour. 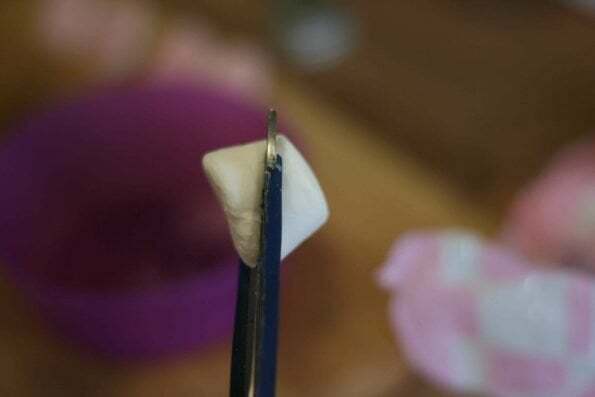 You can also check using a metal skewer – poke it in the middle and if it comes out clean, they’re definitely done. Ideally they should have a nice flat top. Turn your tray in the oven half way through if one half is cooking faster than the other. 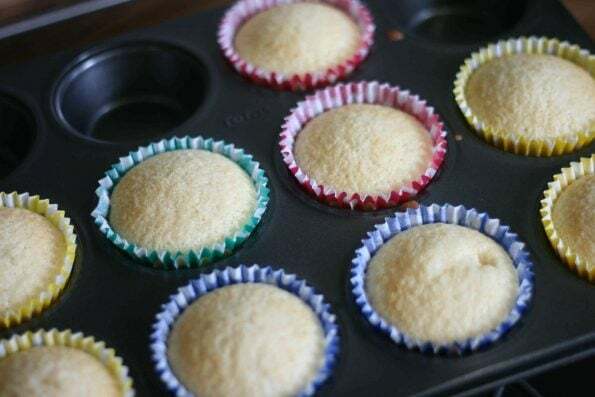 Remove the cupcakes from the oven and leave them to cool in their tray for a few minutes. Then take them out and leave them to cool fully on a wire rack. Mix the icing sugar, and butter in a large bowl or free-standing mixer. Do this at a slow speed to begin with, otherwise the icing will go everywhere! Slowly add the milk and a few drops of vanilla extract. Turn the speed of your mixer up and leave it mixing for 5 minutes or so. The longer you mix it the softer and fluffier it becomes. 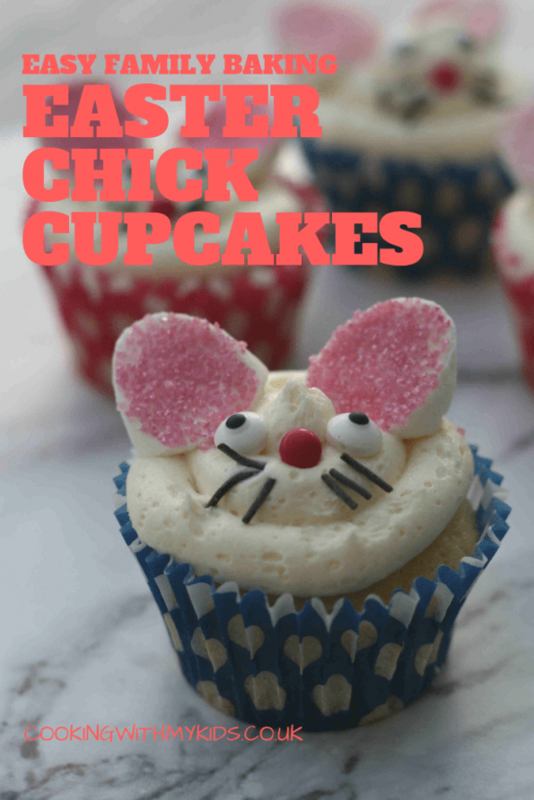 Either pipe the frosting on to your cupcakes or use a pallet knife or knife to spread the icing on top. 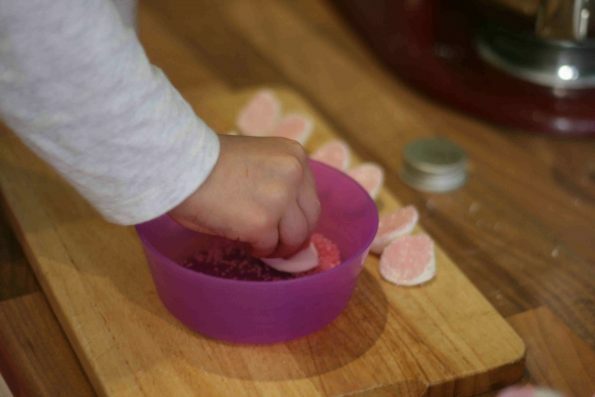 To make the rabbit, pour some pink sprinkles into a bowl, then cut a white marshmallow in half diagonally. Take the inside and dab it in the sprinkles until they cover all the sticky side of the marshmallow then arrange them on top of your cupcake. Add some eyes, a chocolate drop nose and some sprinkles for whiskers. You can let your kids do this, or do some of the fiddly bits yourself. Measure the flour and caster sugar and add them to a large mixing bowl or freestanding mixer. Add the baking powder and salt. Measure the milk and add it to your mixing bowl. Next add the egg and vanilla extract. 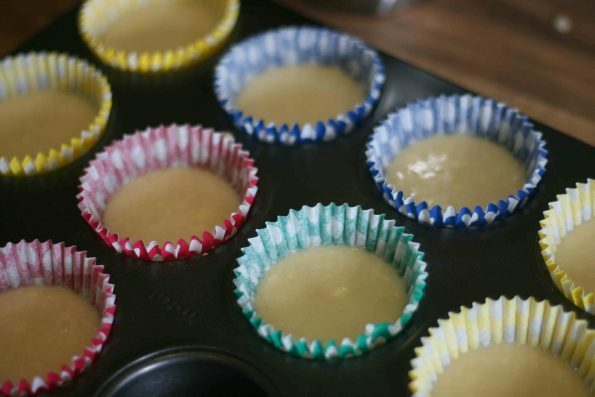 Fill each of your cupcake cases with batter until they are about ¾ full. 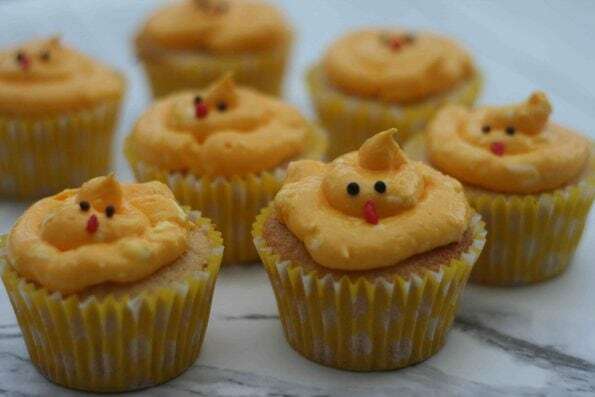 Bake the cupcakes in the oven for 12-15 minutes. 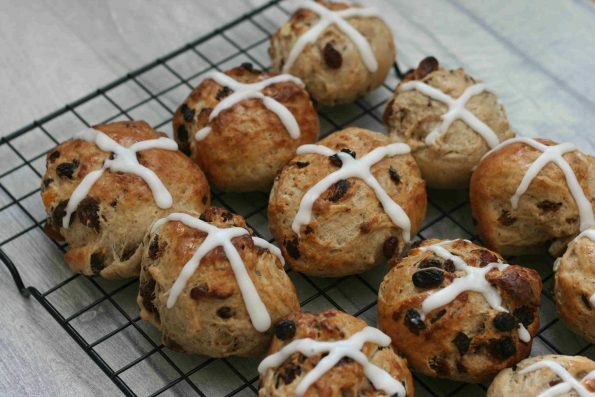 They're ready when they have risen, and turned a nice golden brown colour. You can also check using a metal skewer – poke it in the middle and if it comes out clean, they're definitely done. Ideally they should have a nice flat top. Mix the icing sugar, and butter in a large bowl or free-standing mixer. 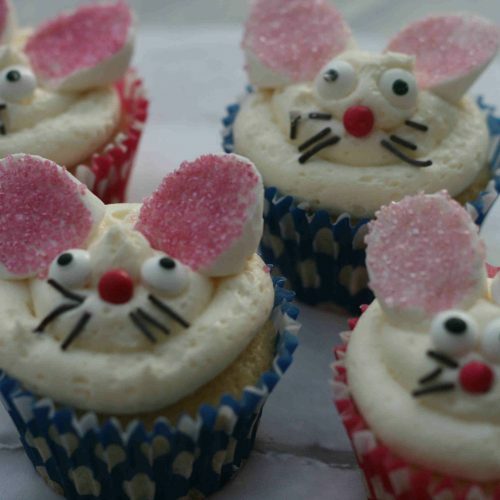 To make the rabbit, pour some pink sprinkles into a bowl, then cut a white marshmallow in half diagonally. Take the inside and dab it in the sprinkles until they cover all the sticky side of the marshmallow then arrange them on top of your cupcake. Add some eyes, a chocolate drop nose and some sprinkles for whiskers. The easiest and most accurate way of doing this is using the ml setting of your digital scales if you have them.